I think I finally “look pregnant” and I’m so happy about it! I’m getting more and more limited in my abilities because of it. I LOVE MY MATERNITY PANTS. They’re so cute and comfortable! Who knew? Washing the dishes has taken a whole new meaning of the word “chore” since I can’t get as close to the sink and therefore have to strain my back to do them. 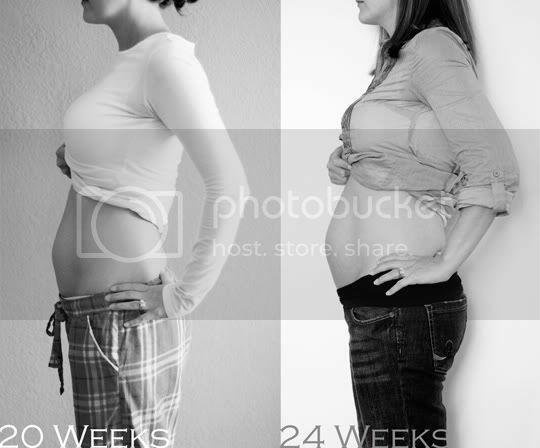 I know it’s normal and hard not to look at a woman’s protruding pregnant stomach in passing, but now that I’m on the other end of the stick… I’m going to try my hardest to never do it to another woman again. My husband loves my growing belly. And I love that he loves it. I now know what heartburn is. It’s the devil. Luckily, I’ve only had it 3 times… knock on wood. This little lady inside is a strong one. Her kicks, turns, spasms, and somersaults move and shake my whole stomach. We can feel parts of her body all the time, usually her feet, legs or back. Ben’s getting so good, he can tell you on his own where she is and what she’s doing. I’m afraid she has her dad’s energy. Those of you who know Ben well are saying, “Uh oh” right along with me. I’m just hoping she gets it all out NOW, because I know I can’t handle another energizer bunny like Ben. I’ve noticed that I’m not shedding my hair anymore. Well, we’ve both noticed because there isn’t hair all over the shower wall anymore. My friend told me this is normal, and that it should all fall out after birth. Looking forward to that. It’s so fun thinking and wondering what she’s going to look and be like. Dark hair? Blonde hair? No hair? My nose? (Hope not) Ben’s eyes? I think I’m on the verge of a lot of things happening/changing: dark line down my belly, stretch marks, uncomfortable-ness, major heartburn, leg cramps, weak bladder, etc. I miss sleep. I can’t take naps and I wake up every few hours at night. Especially when 4am hits, I’m wide awake. The next time I write one of these (at 28 weeks), I’m going to be starting my 3rd and final trimester! CRAZY!! See "What I Know Now at Week 20"
See "What I Know Now at Week 16"
We're off to spend a fun night in the city! Have a Happy Easter and a great Conference weekend! So fun! I loved it when I finally started to look pregnant! It's going to go by so fast! You look so cute! It really is going by quick! Soon enough she will be here and I can't wait to see how cute she is! Lovin that BELLY!! You look so much cuter than I did with these updates! I really am so excited for you guys, having a baby is the best! I've been meaning to email you a list of baby recommendations but just haven't found the time, hopefully soon. oh such fun; i love these updates. have so much fun in the city! and the blog is up! yeah! sending you much belly love! you look adorable! Happy Easter! you are so cute and look great. 6 down, 3 to go!